A good recliner chair can make all the difference in the world. Whether it’s in your living room or in the corner of your bedroom, a nice recliner can provide excellent relief from a long day. You can use it to read, watch TV, or even sleep—but whatever you do, use it to relax. Check out these great lift chairs that provide the comfort and accessibility you need when you’re ready to take a rest. Who Needs a Lift Chair? How Can I Choose the Right Style? This chair is great all around, with a wide range of motion, an easy-to-use motion system, comfort, and a great price. Some may find it a little firm, but it offers great support. Sturdy Construction - Furniture grade hardwood/plywood construction with heavy-duty steel lift mechanism. Lifetime lift mechanism warranty. 325lb Maximum weight capacity with 2 year manufacturer's warranty on parts. Includes an Integrated Emergency Battery Backup to raise the chair in case of a power outage and Chaise Pad. 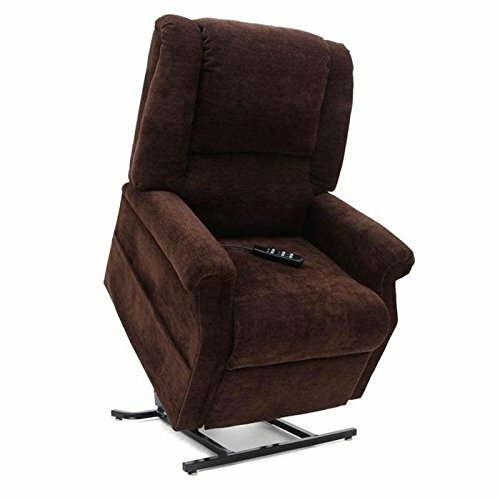 The Mega Motion Easy Comfort Lift Chair is a sturdy, solid chair that uses a heavy-duty steel lift mechanism. With a high max weight capacity, this chair is guaranteed to last and hold up under frequent use. Using electric lift with dual lift motors, this chair has an infinite amount of positions for your individual comfort. The hand controller lets you adjust the angle of the backrest as well as the footrest, while you can also raise and lower the chair. Ideal for someone who has trouble getting out of low chairs, this lift chair will assist you as you stand. The emergency battery backup ensures that the chair returns to its upright position in case of power outages. Enjoy maximum comfort through this chair’s padded wings, roll arms, and padded chaise seat. Additionally, keep all your favorite items close in the convenient side pocket. 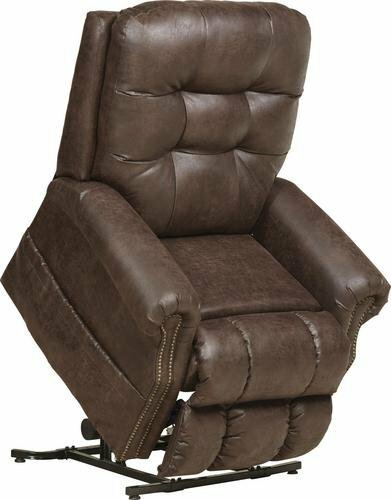 Made with luxurious faux leather, this massage chair is the epitome of comfort. The recliner switches positions easily while it massages you. Not to mention, the cup holders are a nice additional feature. THE PACKAGE OF THIS CHAIR WILL BE SENT OUT VIA 2 BOXES BY UPS OR FEDEX. PLS KEEP THIS CHAIR 45CM FAR FROM WALL. 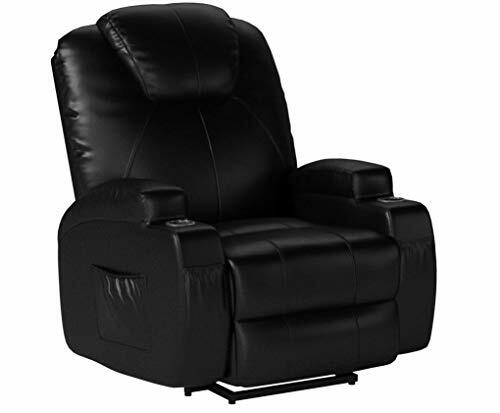 If you want to take comfort to the next level, we highly recommend the U-MAX Power Lift Chair Recliner. This highly comfortable chair is made from soft and sturdy PU leather and is padded with an extra thick sponge in the headpiece, back, and armrest. The functions of this chair are all controlled by two different remotes. The first remote operates the lift and reclining motions, while the other remote controls the back and footrest. The separate remotes mean you don’t have to deal with several buttons at once. In addition to the various movements and positions, this chair is equipped with a massage feature. Control the massage function to focus on your legs and back with five different modes as well as a heat function. Move your chair positions easily and smoothly and enjoy the comfort of the material along with the massage function. When you’re done relaxing, easily stand up with the help of the lift function. This steel frame lift chair is built to last, but we love the massage function with the added heating feature. Easy to use and comfortable, we are sure you will like this chair too. The Catnapper Power Lift chair has been referred to as the “ultimate in lift chairs.” Its sturdy construction uses a steel frame rather than a wood frame to ensure durability. The seat is made from comfort coil seating and also features comfort gel for a more relaxing time. The chair has a tufted back, channeled chaise padding, and rolled arm panels. Within this chair lies a massage and heating system for a great experience. Not only can you adjust the position of this chair, but you can control the massage functions and added heat feature. The gel-infused foam is designed to relieve key body pressure points, making it excellent for those with weak or sore bodies. The premium fabrics also add an elegant touch to any home. Those of a heavier weight may find it difficult to find a good lift chair, so we found one for you. This chair is sturdy, built strong, and made bigger than other chairs. It’s a heftier price, but it won’t let you down. The Mega Motion Heavy Duty Lift Chair is made with heavy-duty construction in mind. With a maximum capacity of 500 pounds, this chair is well suited for those of heavier weight than others. It is designed to be taller, deeper, and wider than standard lift chairs. With three different position settings, users can choose how they would like to sit. You also get assistance standing back up after you have been relaxing. The connected remote makes it easy to gently recline and sit up without having to worry about losing the remote. The chair features a split back design and a chaise seat to ensure the user has the highest level of comfort while using it. Additionally, power recline lets you recline automatically to any position. This simple lift chair is great for anyone who is on a budget. While it may not have extra fancy features like other chairs, it is reliable and gets the job done for a low cost. Care: Chair is very easy to clean. Fabric is soft and durable. Chair can hold up to 300 lbs. If you are looking to purchase a great chair on a tight budget, try out the BONZY Lift Chair. 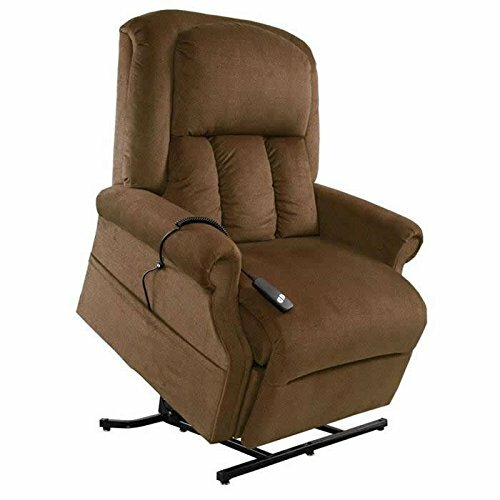 This power lift and recliner chair has a very simple and easy to use remote that not only helps you stand back up but gently reclines you into a comfortable position. The cover of this chair is soft yet durable and is soft to the touch. The thick cushioning offers extra superior support and is very easy to clean. Built and tested to be durable and mechanically sound, you will be able to trust this chair to help you in and out every time. Side pockets offer convenient storage space for remotes, newspapers, glasses, etc. You get all of this for an excellent price. Regardless of their fancy add-ons, they all have the main purpose of helping someone who has trouble getting out of chairs back to a standing position. Lift chairs are qualified as medical equipment. They are very similar to standard reclining chairs with one difference. While they do the same thing as typical reclining chairs—recline back, extend the footrest—they also perform as their name suggests: they lift! A lift chair uses a powerful system that tilts the base and the back of the chair forward. This system helps the user return to a standing position from their original sitting position. All of these functions are done with the use of a remote control that comes with the chair. Lift chairs come with various functions and features, such as massage options, larger sizes, and heat. Regardless of their fancy add-ons, they all have the main purpose of helping someone who has trouble getting out of chairs back to a standing position. The answer to this question is fairly simple: anyone who needs assistance getting in and out of their chair. There are always many levels of this condition, and it can be broken down further to more specific groups of people. First of all, elderly folks who find that they have a harder and harder time sitting down and getting up from a chair may need a lift chair. Unless you have a constant caretaker or live with family, it’s hard to guarantee that someone will always be around to help you take a seat or stand back up. This is especially true for reclining chairs, as opposed to wooden kitchen chairs. In cases where someone of an older age spends a lot of time alone, a lift chair is a great idea. It provides you with the assistance that you may not have available all the time. It also solidifies a sense of independence, which is very important to some people. At the same time, you do not need to be above 60 years old to need a lift chair. Anyone who struggles with some kind of chronic pain or immobilizing condition would find a lift chair helpful to their daily life. People who are recovering from surgery could benefit from these kinds of chairs, as well as those who have lost mobility due to prior surgeries, conditions, or ongoing illnesses. While most people would assume this chair is good for leg or back pain and injuries, we can’t forget that getting out of a chair includes the use of your arms as well. Surgeries involving the shoulders or hands can interfere with daily life too. Additionally, individuals dealing with things like joint pain, a sore back, or arthritis may find one of these chairs helpful. It’s been proven that these types of chairs cause less shoulder fatigue because users do not have to push back to recline like they would in a manual recliner. If you fall into one of the categories above, what will a lift chair purchase do for you? There are many benefits to owning one of these specialized seats. The functions of a lift chair help people regain their independence. We sit and stand up every day more than we realize. It isn’t until we can no longer do this on our own that we realize how basic and regular of an action this is. Constantly having to depend on someone for help getting in and out of a chair can feel inconvenient and degrading. Lift chairs allow people to do it all on their own. They also help to improve posture. Since these lift chairs also function as electric recliners, they have remotes that let you change the position. Many chairs have wide ranges of motion, allowing you to pick the position that works best for you. They move slowly and smoothly, so they won’t disrupt or agitate any injured or sore part of your body. Elderly users can expect less fatigue for a couple of reasons. For one, they don’t have to use as much effort getting up and sitting down. That can take a lot of effort that can quickly wear you down. Additionally, it’s been proven that these types of chairs cause less shoulder fatigue because users do not have to push back to recline like they would in a manual recliner. The elevation settings you can use on your leg rest help to improve fluid reduction. This is good for circulation and can lessen swelling and pain in the legs. Finally, it has been proven through various studies that lift chairs can increase muscle tone. They can also reduce skeletal joint degeneration. It is very important to nail down all the above details to figure out which chair is best for you medically or physically, but everyone wants furniture that looks nice too! Experts can certainly help you out with this, but it is always a good idea to prepare yourself ahead of time. Consider a few things before purchasing your chair. When deciding on what material you want your chair to be, ask yourself how often you will be eating or drinking in the chair. If you plan on doing so often, you should look into vinyl or leather upholstery. They are easier to clean and won’t stain as quickly. Lots of people have pets, and lots of those pets like to cuddle up next to their owners while they relax or watch TV. Do you have a cuddly pet? If so, you should consider getting a wider chair so that they can fit with you. Think about how much time you plan on spending in your chair. Is it just for relaxation, or do you plan on sleeping in it? If you intend on spending long periods of time in the chair or even sleeping in it, you should invest in an infinite-position chair as opposed to a two or three-position chair. The infinite-position chairs are much more capable of facilitating healthy and comfortable sleeping positions. Believe it or not, some companies will offer lift chair rentals. This is a great idea for someone who only needs this chair because of a temporary situation, like surgery recovery or a short-term stay with relatives. It can be less expensive and will serve its purpose as long as you need it. When you are recovered or have moved on to a different situation, you take the chair back. You can also rent chairs to decide if they’re the right fit for you before deciding to make a purchase. 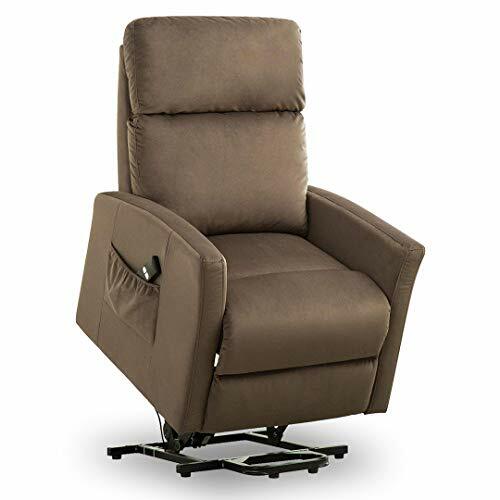 Regardless of the specifics involved with your situation, those who need a lift chair can find a great source of comfort in purchasing one that suits them well. They offer support and allow you or your loved one to maintain a higher level of independence and security. An investment in one of these chairs could mean a world of difference in someone’s life.